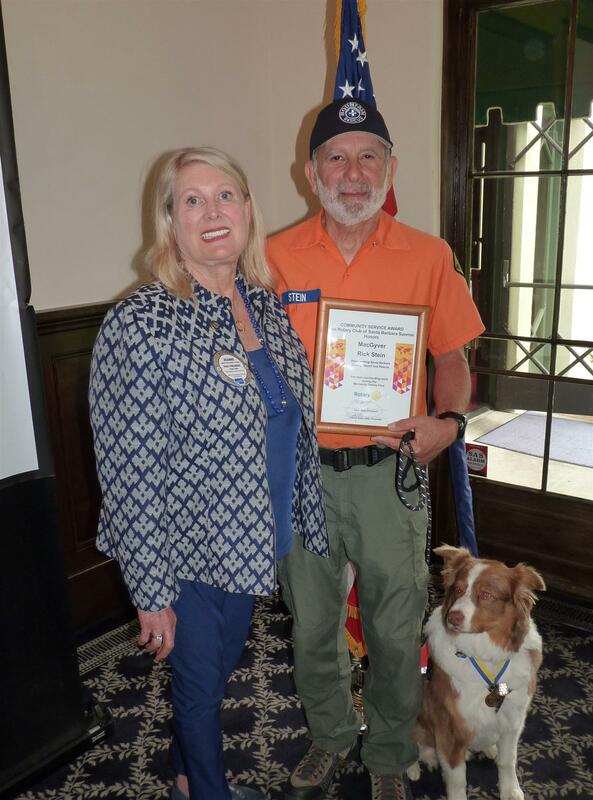 Santa Barbara County Search and Rescue K9 MacGyver and his handler Rick Stein were honored with a Pup Harris Fellow (a.k.a. 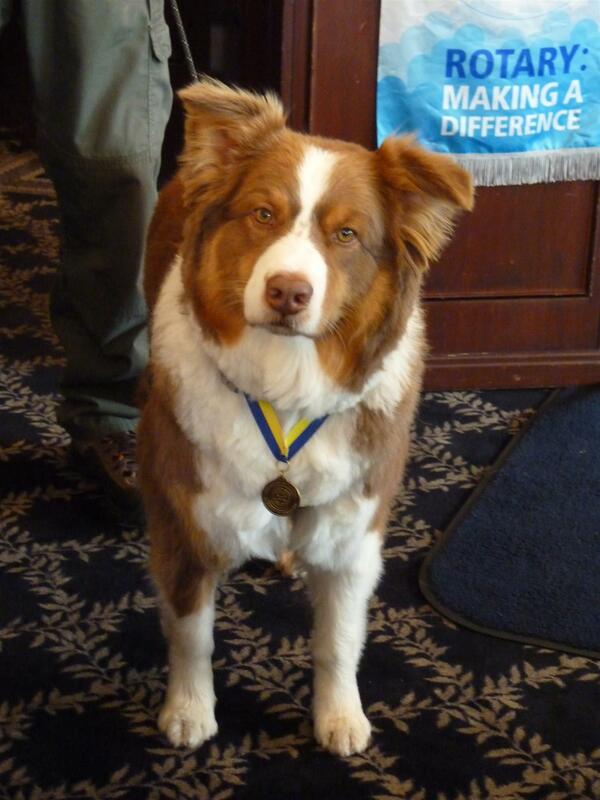 Paul Harris Fellow) recognition, Rotary’s highest honor. MacGyver and Stein work side by side to find lost people. MacGyver, a 5-year old Australian Shepherd, is specifically trained off-lead to find live, and if necessary, deceased human scent. Santa Barbara County Search and Rescue dogs are owned and trained by their handlers, who are volunteers and not paid for their work. They are on call 24/7 and can be deployed 365 days a year. Joanne Schoenfeld honored MacGyver and Stein with a special Pup Harris Fellow for their critical search and rescue efforts during the Montecito Debris Flow Incident earlier this year. Santa Barbara County Search and Rescue is dedicated to providing professional search and rescue capabilities to the Sheriff's Office and the citizens of Santa Barbara County. Their goal is to locate, access, render aid and provide quality, expedient services to persons in distress and to minimize injury and loss of life. For more information, visit www.sbcsar.net. The Rotary Club of Santa Barbara Sunrise is made up of local business, professional, and civic leaders. They meet regularly, get to know each other and form friendships, and through that they are able to get things done in both our local and global communities. The club is active in local service projects, including a free dental clinic that provides critical care to the underserved in our community. It purchases and distributes free dictionaries to all 3rd graders in the Santa Barbara Unified School District and recognizes at-risk youth at La Cuesta Continuation High School with a Student of the Month program. It also engages in hands-on improvement projects at Camp Whittier, part of United Boys & Girls Clubs of Santa Barbara County. Internationally, the Rotary Club of Santa Barbara Sunrise supports a children’s orphanage and surgical eye clinics in Mexico in addition to funding clean-water projects, medical clinic improvements, and a pharmacy project in two rural communities in Nicaragua. The club meets for the “best breakfast in Santa Barbara” every Wednesday at 7am at the Historic Santa Barbara Club. For more information, call 805.884.6428 or visit their website at https://portal.clubrunner.ca/2855.